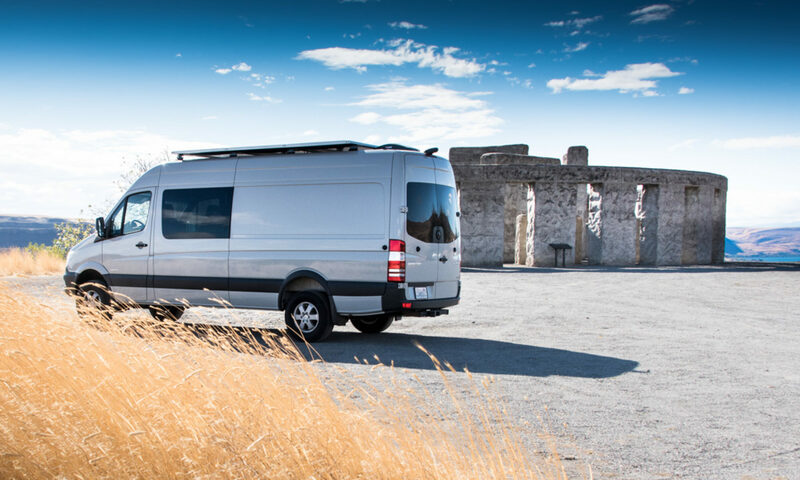 Adding plumbing to a van is almost as much hassle as running electrical wiring. There are no easy places to run pipes through the walls and you have to stop everything from freezing or leaking. We decided to plumb the van with hot and cold water. We get dirty on bike rides and solar showers don’t warm up that much during Pacific NorthWest winters. We have no plans to put a full-on bathroom inside the van though – that’s a complete waste of valuable bike storage space! Instead, we chose to run a shower hose to the back door. We can clean off there, or inside the van at the sink. We settled on a 16 gallon water tank, with a 4 gallon hot water heater from Indel. We wanted larger tanks but just couldn’t make them fit in our design. There’s a lot to be said for building your own bench seat rather than using the stock one – all that potential storage space under the seat would have been great for our tanks! Instead, we’re running them against the passenger side wall in the rear of the van. The area above the wheel well is now a storage bin. In front of it is the hot water tank, covered in bamboo to match the units in the front of the van. The top of the hot water tank cover is level with the arm of the three person bench seat, which slots in right next to it. The cold water tank sits behind the rear wheel. It’s held in place with super-long hose clamps! The tank comes with some 3/8″ NPT threaded holes on each end. We added a tank fill with a threaded cap. They also make one with a straight 1-1/4″ barbed fitting. It’s pretty easy to cut through the ABS tank wall and then the fitting just glues in place. Turning it 1/4 turn as you set it in place seems to help spread the adhesive around and seal any potential leaks. 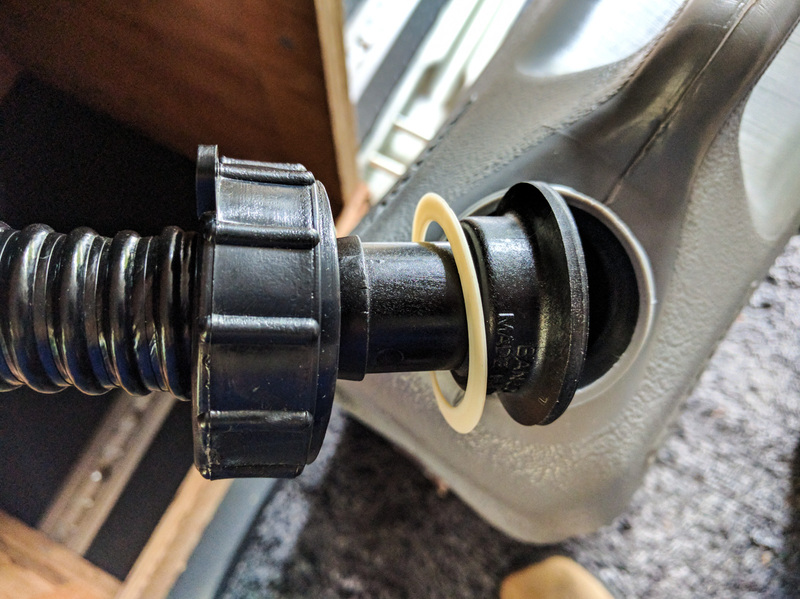 Because there’s a 5″ gap between the top of the tank and the top of the box that encloses it, we added a short length of 1-1/2″ ID PVC hose to this threaded tank fill and put a deck fill plate on the other end of the hose. Also in this picture, you can see the one-way polypropylene check valve we installed as a breather for the tank. It connects to the top of the tank end wall and lets air in to the tank as the water inside is used up. It works really well to equalize the pressure in the tank without letting water slosh out. In the picture it has a breather vent cap on it (the chrome/brass piece) but we’ve taken that off subsequently because the valve is installed in a relatively clean area and the breather was restricting flow. The coin-covered plywood will eventually have aluminum angle on the corners. We like to make everything in the van serve double duty, so the bolts that hold the access panel on are also l-track tie-down clips. The water heater uses 120v power. It will run from the battery with no issues. It uses about 10% of the battery’s charge (75 Ah) to heat up from ambient. In the future if we want to we can also plumb it to use engine coolant, so we heat the water free of charge just by driving along. The water heater comes with a tempering valve to maintain a constant hot water temperature at the faucet, regardless of how hot it is in the tank. The water pressure is provided by a 12v pump. 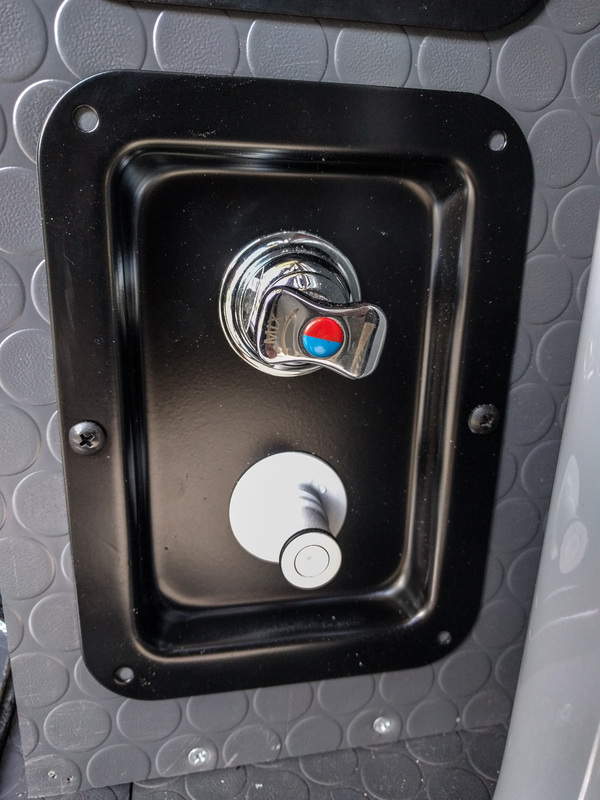 Most RV pumps need a separate pressure tank (called an accumulator tank) so they don’t run all the time a faucet is open. 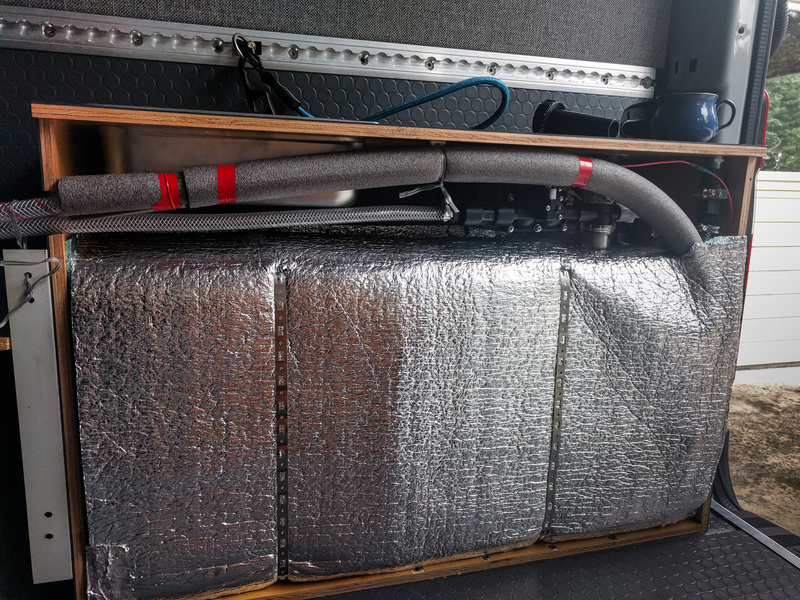 The one we chose (Shurflo Revolution) has a built-in bypass system that means it doesn’t need that extra tank. The pump sits above the cold water tank. We also had space above the tank to add a stainless steel cubby to hold the shower hose and head. It’s actually a 1/3 size chafing dish from a professional steam pan like you see in restaurants. It fits really nicely in the available space, and looks great from the outside. 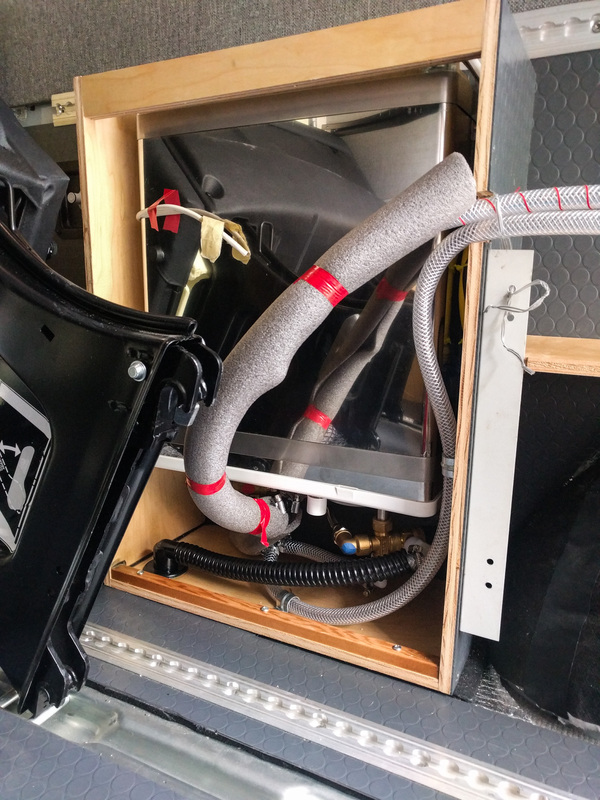 We chose to use flexible 1/2″ ID PVC braided tubing (similar stuff available from Amazon cheaper but seldom in stock in 1/2″ ID) to move the water around the van. We were going to use PEX tubing, but our design means we have several locations where it would be hard to fit the more rigid PEX pipes. That means using barbed fittings and hose clamps at each joint. We’d rather have used some ear clamps, but they are much harder to reposition, and we knew we’d be messing around with the fit of the components a couple of times. We used plastic hose fittings. Most of the components need 1/2″ NPT ends. We found most of the female style plastic fittings were not strong enough to form a good seal on male NPT metal fittings. Some, like this really beefy T, were fine. Most, like these 90 degree ends, were not. They expand too much over the metal, and even if they initially form a good seal, when the connection gets hot the threads leak. The plastic female fittings did work find on plastic male NPT threads though (like the pump connectors). The plastic male fittings also worked fine in either plastic or metal female ends. 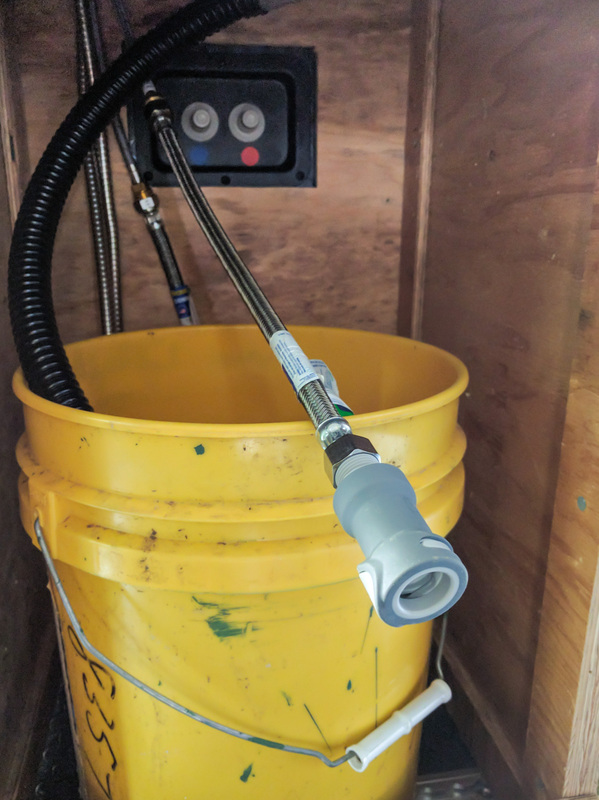 Most of the available brass connectors are not rated for potable water (they contain too much lead), so we had to use flexible braided hose in a couple of locations. This then gave us a female hose end to use with a male plastic barbed fitting, which worked fine. If you work with these plastic fittings, follow the instructions: only tighten them by hand, and don’t use PTFE thread tape or other lubricating thread sealants. If you do, you’ll only tighten the connector too far, which will make it more likely to crack or leak. Because we want to be able to remove the sink unit, we used quick disconnects on the hot and cold connectors. We also used one on the shower hose at the back of the van. The quick disconnects made for garden hoses aren’t safe for potable water (too much lead), so we ended up using industrial plastic ones made by CPC. They seal closed on both sides when you disconnect them, so there are no leaks. We used panel mounts with 1/2″ barbs, and couplings with 1/2″ NPT threads. The metal panels that the quick connects are mounted in are the same as the outlet plates we wrote about earlier. All of the plumbing is inside the van. That helps to make sure it doesn’t freeze during the winter. We also added a 12v heating pad under the cold water tank, with a cheap digital thermostat set to come on if the tank approaches freezing point. 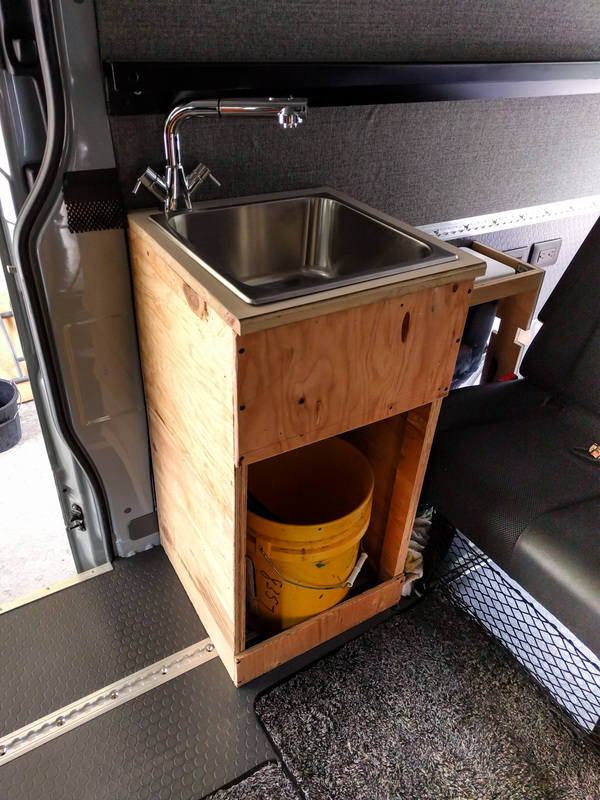 We added a sink inside the van too. After looking at the incredibly cheap and good value for money Ikea Fyndig sink (under $30) we bought an Ambassador Marine sink – mainly because it was just a little smaller in every dimension, but also because it has a smaller size drain outlet that will fit the super-compact Ambassador Marine sink drain and strainer basket. This drain does not include a trap, so any fumes from the waste water tank could come straight back up. However, because it uses a 1″ hose for its drain, you only have to put a loop in the hose to act just like a regular sink trap. Alternatively, you run the waste hose to the bottom of the waste water container. Then, it seals just as soon as the water covers the base of the hose. The sink unit is currently made of shipping crate plywood is made of 80/20 aluminum extrusion with bamboo panels. 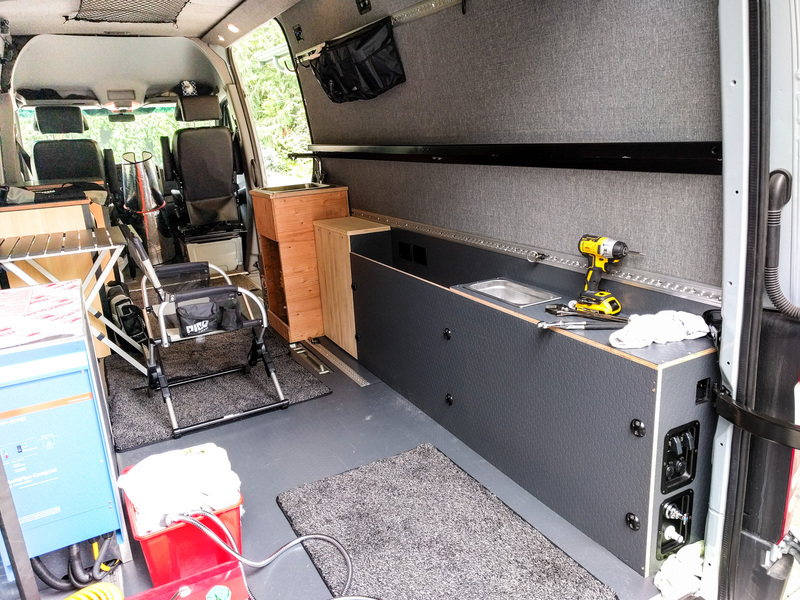 We wanted to make sure it was the right size and worked for us in the van before we committed to building the final version, so we lived with the prototype shown in this picture for a while before we built the final version. 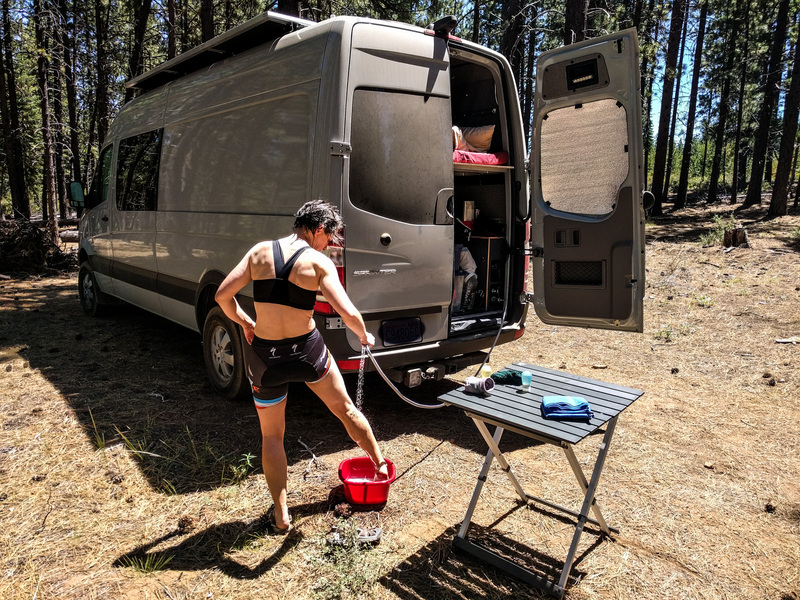 We chose to use a faucet with an extending head, so it can double as a shower inside the van if necessary, and also to make it easier to fill water bottles and camelpacks for biking. Although there’s a yellow bucket in the pictures here, we’re actually using a Reliance Rhino Pack 5 gallon jerry can to hold the grey water from the sink. We bought a 1″ barbed fitting to replace the jerry can spout. After we’d cut it down to size on a lathe, it fitted just fine in the spot where the spout normally sits. The 1″ hose from the sink drain attaches to the barb. When we need to empty the can, we just unscrew the lid. Even though the vent in the can is closed, we don’t have any problems with the sink draining. The plumbing system is actually pretty simple. What made our lives difficult was the confined spaces we chose to put everything in. We had to buy a couple of 90 degree fittings just to make the hoses reach. In the future, we might add a transparent pipe on the side of the cold tank to make it easier to see how much water we have left. For now though, everything works, nothing leaks (fingers crossed), and we have hot and cold water on the go. If you don’t mind sharing, what size sink did you use? There are several options in Amazon link. Hi, we used the 14-1/2″ x 14-1/2″ x 6″ deep sink. That’s the measurement of the outside of the flange around the top. The bowl itself is slightly smaller because the flange is about 1/2″ wide. Can you tell me what shower mixer that is? It’s a Scandvik shower mixer. If I was doing this over again, I might use the Ambassador Marine mixer instead. The Scandvik one works fine, but the Ambassador looks like it would be easier to control. Do you have more photos of the shower system quick connect system? I’m trying to make the same system. I don’t have any more photos, but tell me what you want to know and I’ll see if I can take some relevant pictures for you. The quick connects come with either a bulkhead fitting with a barbed connector or a threaded connector to attach directly to a shower or faucet hose. We used the bulkhead fittings on the female half of the quick connects attached to the Penn Elcom metal plates. We used the threaded connectors on the male half, with the correct thread type for the hoses we bought. Whats the hose to the shower connection? The hose to shower head…. How much did you spend on the whole unit? I’m debating the RB componets? Thanks for the help. James, I just added a couple of new pictures to the post. Now you can see how we connected the shower head to the quick disconnect with the cheap hose from Amazon. James, the hose behind the scenes is all 1/2″ ID PVC braided tubing. The hose to the shower head is a cheap one from Amazon. You’ll need to make sure you buy one with the correct diameter and thread types for the quick connect and the shower head you choose. If you aren’t planning on drinking the water from the shower hose, you can use an outdoor quick connect designed for garden hoses. Those don’t have an automatic shut-off when they are opened though. They have a lead content that is too high for potable water. We sometimes fill our bike water bottles from this quick connect outlet, so we wanted food-grade fittings. I can’t really split out the cost of the shower unit from the whole build. The shower head (Amazon) wasn’t cheap, for sure. There are cheaper options out there, but the push button on/off control on the head is really useful. The RB Components shower system seems overpriced to me. Especially considering their “shower head” is actually a garden hose attachment. Scandvik makes an all-in-one recessed unit (Amazon) – admittedly ABS rather than aluminum – for a lot less money. Cool. Good to know they’re out there. Hey DieselFumes! Yet another question. Starting to plan out my water system and sink. Likely will be in the same location as yours with a D5/IsoTemp Slim for a heat source (GeorgeRa recently finished his as you probably know). I was just looking at your sink cabinet and the additional cabinet that covers the door space. Just wondering if you’d extend your sink forward into the door opening to be able to squeeze in a larger water tank. (And incorporate it into the second cabinet or eliminate it altogether. Anything you’d do differently second time around? Seems like there might be some additional tank space available. We like the flexibility of being able to remove the cabinet inside the sliding door. In fact, we don’t use it that often. If we were using that cabinet all the time, I’d definitely consider moving the hot water tank to that location. The benefit of putting the hot tank where it is next to the bench seat is that the space there would be wasted otherwise. If we put the hot tank in the cabinet, it would take up accessible storage space. BUT it might make the tank more accessible for maintenance, draining, etc. I think I’d keep the cold tank where it is behind the rear wheel. Obviously that works better in a 170 van than a 144. We haven’t found a need for more than a 16 gallon tank. If we need more water, we just carry it in additional 1 gallon or 5 gallon containers and re-fill the 16 gallon built-in tank as needed. If our cabinets were built in rather than removable, I’d make the sink and sliding door cabinet into one unit and probably move the sink forward more in that countertop. We are currently toying with the idea of adding a composting toilet. If we did, the cabinet for it might end up where our sliding door cabinet is now. 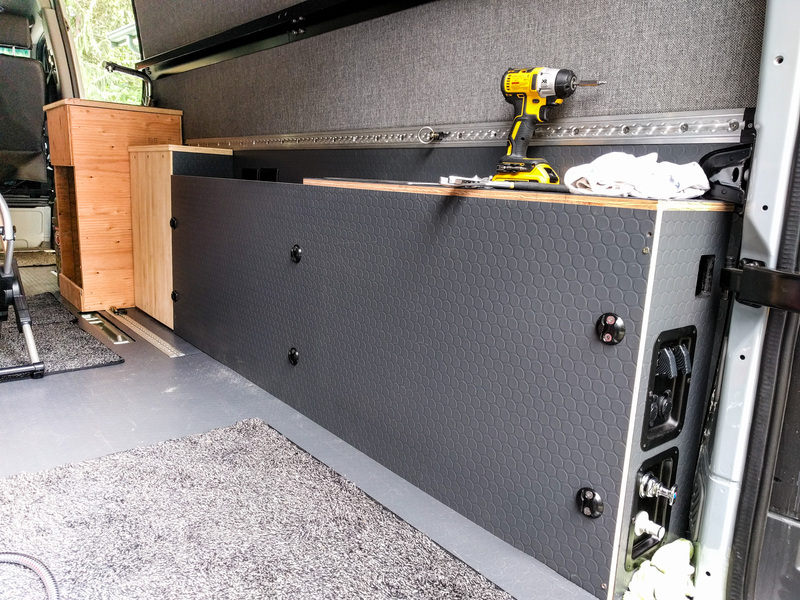 Again, we wouldn’t want it in the van all the time, so making it (and its cabinet) easily removable from the sliding door location makes sense for us. If I was making my hot water system again, I’d be very tempted to use the D5. Any comments on the ABS cold water tank and drinking water ratings? I couldn’t find any. Do you have a way to drain it? Is there any problem with “sloshing” when you are driving? Should one plan for this? The ABS tank is rated for drinking from. There is no taste. Valterra says something about that in the tank’s specifications. We put a drain in at the lowest point on the end of the tank. That doesn’t completely drain it. You’d be better off adding a fitting on the bottom of the tank. There is no real problem with sloshing. The tank has internal baffles that do a good job of stopping any water movement. We added a fill hole on the top of the tank and it was relatively easy. Valterra sells kits, but any ABS fittings would be fine. The ABS pipe adhesive pretty much melts the plastic parts on to each other, forming a good seal. Thank you! I think ABS is better to work with in terms of fittings being installed compared to polyethylene? But not sure of that. Do you happen to know off hand? I don’t know for sure about the ABS/polyethylene differences, but my understanding is that with polyethylene it’s best to friction-weld fittings by spinning them on. With ABS it’s just a glue thing. That probably makes ABS easier for the average DIY-er. We chose ABS because it was flavor-free, and the Valterra tanks came in the right size for our needs. Thanks! I’ve spoken with a plumber friend. He confirms no glue works for polyethylene. He suggested using a fittings called “bulkhead adapters” which hold up “very well”. But they are not blind fittings so if I go this way will use a marine waterproof hatch cover so that I can access the inside of the tank from the top. Which could be good if I ever needed to check out the inside of the tank for cleaning etc etc. I was thinking the translucent polyethylene would be good for being able to visually check water levels. I was also under the impression it was “more potable” because you tend to see it in water supply while you see ABS in drainage. But I don’t know. I also think of ABS as being more rigid and thus perhaps not as durable. Especially should one accidentally freeze the tank (as I could well do). I’ve used marine screw down hatches before for accessing boat hulls and they work well. Yeah – the bulkhead adapters have a gasket that seals them in place. If you have access to the inside of the tank, I expect they’d work well. The ABS tank we have isn’t particularly rigid – about rigid enough to hold the fittings in place, but flexible on the long walls. It’s much thinner than a poly tank would be. I don’t know how the tank weight compares. Having the ability to see water levels would be nice. We considered running a see-through tube from top to bottom of our tank to give us an external level gauge. Haven’t done it yet though! Hi, I used #60730 (1/2″ NPT) and #60741 (1/2″ barb). If you look in the digital version of the paper catalog, it shows things in a little more detail. The panel mount versions have a separate threaded section to mount through the wall. The threaded section would not be deep enough for 1/2″ plywood. You need sufficient space behind the panel for the hose to attach (somewhere around 2″, I’m guessing). Sorry for the slow response but thank you for the information on the USP plastic fittings. One more question. I’m using create a clamps to secure our water tank, and I was wondering how you attached them to the van. I’ve looked at your pictures but I can only guess they are somehow screwed into the subfloor or through bolted. Just wondering if you could share how you did this? We screwed into the wooden box that the water tank is contained in. I think two screws into the “wall” and two into the “floor” of the box per create-a-clamp. I’m sure you’d get the same effect if you screwed into the metal wall/floor of the van itself. So far, it’s held just fine, but the wooden box also provides some structure to hold the tank in place. Hope that helps! I ordered and have assembled my outdoor shower just like yours! Have everything good to go except…fittings that come with the mixer are NPS not NPT. The back of the wall mount quick disconnect a barbed fitting, and coming off the back of the sxandvik mixer are: a 3/8”” NPS M mixed water line, and two 1/2” NPS F hot/cold inlet. How did you adapt your fittings/connections to NPS for the Scandvik unit? I’m having a lot of trouble sourcing adapters. Kipp, I hear you on the whole NPS/NPT thing. 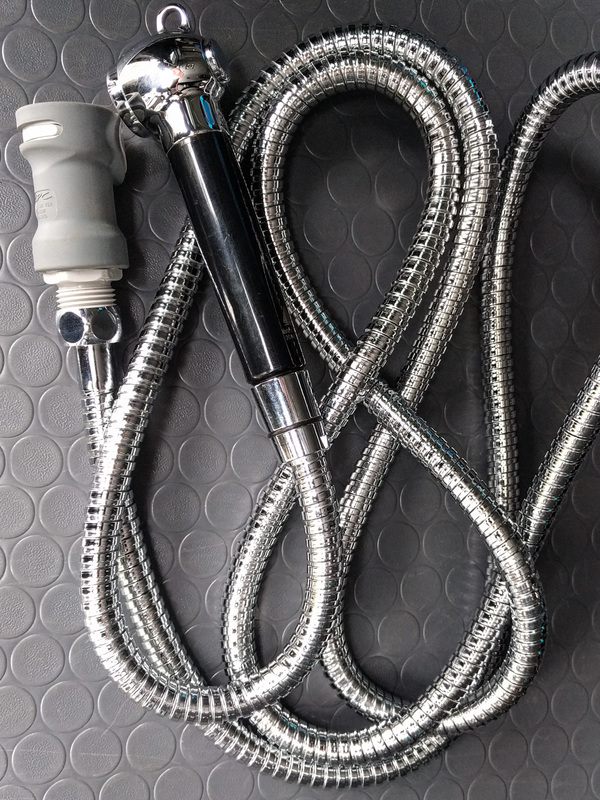 We bought some NPS-to-NPT flexible stainless braided hoses from the local hardware store. The back of our quick disconnect was 1/2″ NPT so that was easier for us. For your barbed fitting, you’ll just need a length of hose and then a barbed-to-NPT (or NPS) fitting. Persevere – the outdoor shower is worth it! Finding the NPS to NPT flexible hoses is difficult! To clarify-you first attached the provided hoses to the mixer and then bought SS flexible braided adapter hoses off of the provided hoses? Scandvik says these are the fittings provided: “Flexible supply lines with 1/2” NPS-F fittings. 3/8” BSP-M connection to shower hose”. So it’s also an adapter for the BSP one-right? WHEW! Thanks for your help-quite the little hunt :). Really appreciate the replies. To be honest, I don’t remember the exact set of connections we ended up with. It’s quite possible I substituted the Scandvik hoses and connected mine directly to the mixer. Checking back on my receipts, it looks like my panel mount quick disconnect is indeed a barbed fitting. I know I didn’t end up using the Scandvik hose that leads to the shower head. Instead, I used a cheap one from Amazon that was longer and more flexible, and which had the correct threaded ends for the quick disconnect. Thanks. Figured out the connections! One last question (promise :)): connections and sealant/plumbers tape. I notice you said you didn’t use tape on plastic connections. Did you use a plastic sealant on these? What about on plastic-metal (male-female)? Seems like there are mixed opinions. Many of the ‘old timer’ plumbers on some forums I was browsing suggest plumbers tape on ALL threads, including plastic-plastic! Kipp, I followed the advice I read on the US Plastic site where I ordered some of the parts. They said that adding tape or sealant to plastic fittings makes it too easy to over-tighten them. That’s likely to be an even bigger problem with plastic-to-metal connections. The conical thread on NPT fittings would make it really easy for a male metal thread to split a female plastic one. I only used sealant on the metal-to-metal fittings that had no integrated rubber washers or o-rings. Our system has remained leak-free (as far as I can tell!) since then. Just be sure to pressure test your fittings before you close everything behind panels. Paper towel under each fitting will let you see if there’s a leak at all. Andy, we like the components we used and the water tank capacity is large enough for us. we would mount the tank slightly higher and have a drain in the underside of it – maybe even mount the pump underneath it. Also, the pump really needs a 1/2″ feed line and the output from the tank is 3/8″. We will probably re-fit ours, raise it up, and put a 1/2″ coupling on the underside. Other than that we are happy. I ordered a couple of the stainless steel flexible hoses you linked and noticed that they reduce the ID of the hose by quite a bit. Were you ever concerned about this? How have these hoses lasted over time-do you have an updated opinion on them? Kipp, I don’t really have any updated opinion on the hoses. They appear to be doing their job pretty well, which is about all you can ask for from hoses, I guess. They do reduce the ID of the system at that point, but I don’t know that it’s caused a problem. Thanks for documenting your excellent system work! Thanks! It’s sometimes hard to put all the pieces together but it’s definitely worth it when you do. Have fun with your NV. Can you explain the Vent/Check-Valve a bit? As I understand it – The vent is to allow for air to leave the tank when filling and to also replace the water to avoid creating suction. Is the check-valve designed for Air or water? I assumed it was to keep any sloshing water in the tank, but maybe I am wrong. Brian, the check valve is a one-way valve that lets either air or water into the tank but does not let them back out. So, putting it on the end of the vent pipe means it will let air in but not let water out. We are not using the check valve to allow air to leave the tank when filling. The fill hole is large enough that air leaves through that hole when we pour more water in. Makes total sense – thank you! 1. Did you put a winterizing blow-out on your system? 2. I have a drain on my 20G fresh water tank. Do you think I need one after the pump like you show in your diagram? 3. Do you just drain the hot and cold inside the plumbing compartment or do you have it piped to an outside the compartment valve? 1) No blow-out. Gravity works OK for us. If there’s a little water left in the pipes, it’s not going to cause major issues in the temperatures we experience. 2) The pump will probably stop the pipes from draining back to your tank. A drain after the pump will let you drain the pipes. Having said that, we get most of the water out of the system by running the pump with the shower hose open. That seems to drain the pipes pretty well. 3) The hot drains out through a hole in the floor under the hot tank. It’s the same hole as the pressure relief valve uses. You NEED that hole regardless of whether you intend to drain the tank from that location, because the Isotherm tank drips water from its pressure relief valves during regular use (by design). The cold drains mainly through the shower hose via the pump. We can attach a pipe to our drain valve and have that drain out through the back door too. Makes total sense and great to know about #3. I have the same hot water heater and haven’t pulled out of box yet nor have I looked at installation instructions so didn’t know that. Great information. Hi! I am finishing up a calorifier setup in my VW T5 van, using the engine cooling circuit. 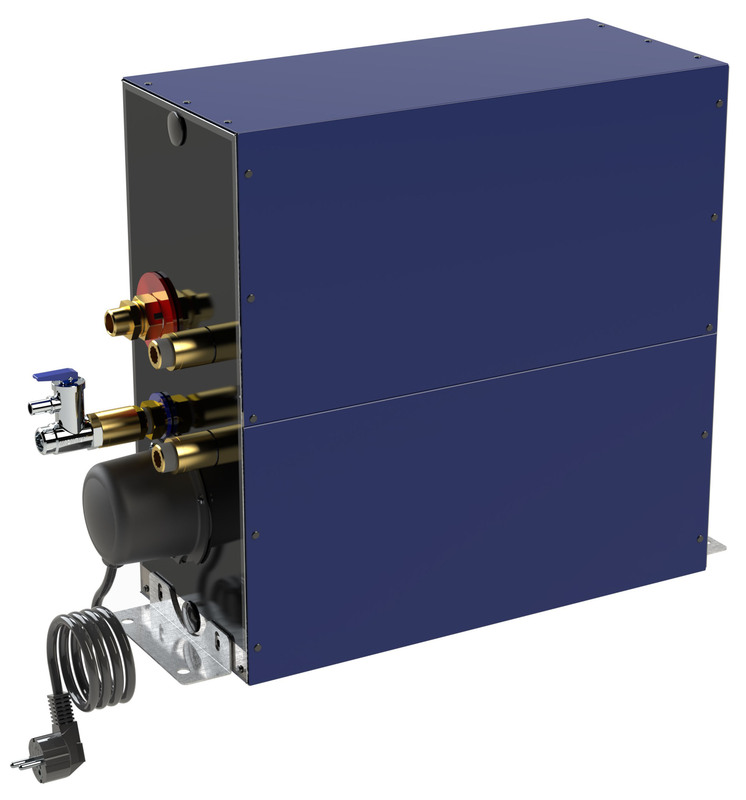 The boiler is a square 20L marine boiler, made in Italy. I am pretty excited after weeks of research, planning, sourcing components, plumbing in the tiniest of space etc. Tomorrow I will take out the whole install and pressure test it at home. Maybe even try out the optional 220V element. One thing I am a bit surprised about, you don’t use an expansion tank? Your pressure relief valve is draining every time you heat up water? Anton, it’s always an interesting challenge to fit all the plumbing in to such a small space and a little nerve wracking when you first fill it with water. Doing a pressure test outside the vehicle first is a great move! We didn’t install an expansion tank primarily because our water pump doesn’t need one to prevent knocking. It was only after we’d put the system together that we realized the expansion tank would also have been useful for the hot water tank. So yes, if we were doing this again we might install an expansion tank but I’d want to test the idea first. I have a feeling that the water pump pressure will already be using most of the capacity of the expansion tank so we might not get a whole lot of benefit from adding it. We lose very little water through the pressure relief valve at the moment. Oh Gee, it looks like my first comment didn’t come trough… let’s try again. So yeah, today I pressure tested the calorifier parts on my desk (just jerry cans, no water tank, I did that earlier) Everything looks good, no leaks so far. I plumbed in a pressure gauge which stays steady at 2 bar and I hope so until tomorrow morning. Once I had my 20L inside the calorifier, I run into a nasty problem.. how do I get it out again?? I thought the relief valve could be used as a drain as well but realised that there is a non returning valve just behind, to prevent hot water flowing back into the cold feed. I could plumb in another Tee for a drain (next to the gauge) but it will not get all the water out by gravity only. What do you think? I see the Indel’s have a real drain at a low point? My pump has also a doc about why and how you should “convert”. I work on a boat. The bilges under the engine always made some water, the boiler is just after the engine compartment. Turns out the relief valve was defect. Guess what, no expansion tank. But hey, if your install works fine never mind. I would suggest to check your valve regularly, and get a spare one just in case. Thanks for the writing on your blog! Oh and another question… How do you fill up? Working on the pump connection part of my install I had this inspiration… why not reverse the pump feed connection and “blow” the water from a jerry can all the way up in the tank. A small test proved it works brilliant. Much better than having to juggle with a full jerry can above the bed! The nice thing about these pumps are the Snap-In Quad Port fittings. You also have the strainers with those ports on one side. 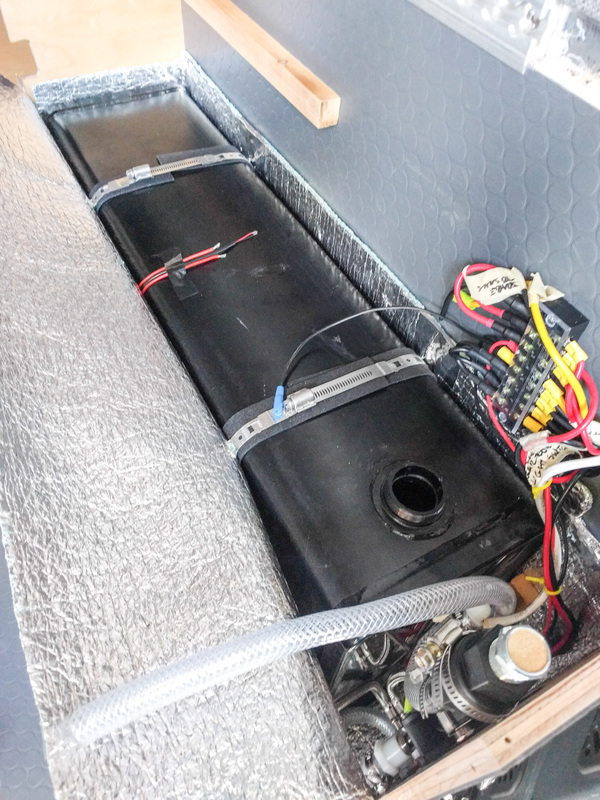 I have my pump bolted to a plywood board that slides into the groove of my aluminium T-slot structure in the back of the van, that way when I swap ports I slide the board out and small water spills stay just outside the van! We fill with a hose most of the time, or with jerry cans. The fill location is close enough to the back door that we can stand on the ground and still (just about) pour a 5 gallon container into the tank. Typically we put a towel down around the fill area just in case. Your pump solution makes much more sense. hey Andy, I’m pretty sure we used the regular 1/2″ tubing. Looking on the invoice, it was the Nylobrade® version, if that’s any help. Do you think your 12v heating pad and thermostat, that you referenced in this article, would do well to keep my lithium house batteries above freezing? They are stored in an electrical box and would be nice to be able to keep them in the van all year long. Brian, a 12v heating pad might well do the trick. It’s something I’ve contemplated adding, but if we’re using the van it’s going to be above freezing inside anyway! Are you removing your batteries from the van to protect them from freezing? There is normally no harm in letting lithium batteries get below freezing temperature, or even discharging them when they are below freezing. The harm is when you charge them below freezing, because it encourages the growth of lithium crystals on the electrodes. In fact, putting a load on the batteries warms them up slightly too! Yes, I live in Flagstaff, AZ (7000 feet) and I take them out of the rig to keep them from freezing when I am not using the van during the winter. I’d like to find a way to keep them in permanently. I did order that heating pad and a thermostat, so will give it a shot to see if it works. I was looking at the heating pad that you used from Signswase – it has four wires coming out of it. I tried to look them up online to get their spec/install instructions, but I couldn’t find them. How did you wire it? The power comes from your thermostat, but of the four wires, which did you use? Jon, Signswise sell several heating pads. We ordered one with just the power wires, but they shipped us one with four wires. The two thick wires are the power wires. The others are (I think) a thermocouple to use as a thermostatic element, but I don’t know its specs.